South Africa is in the process of rectifying the social injustices of the past and building a new future towards "equitable access and participation " in the agricultural sector (DoA, 2001) through the transference of farmland to emerging-black farmers and communities. This new class of farmers needs an effective extension service to help them become commercial farmers. However, agricultural extension is generally viewed to be ineffective. Thus, there is also a need for a revised extension model for, in this case, the Eastern Cape Province of South Africa. Eight factors were identified and were included in this study. The eight factors, viz. This paper is aimed at discussing the identified factors, related to organizational and human capital development, that are essential for effective extension and will propose the basis and design framework of an extension model discussed in a later paper. Researchers who are currently undergoing an academic programme/training at the University of the Free State and extension officers were interviewed via questionnaires in order to determine their perceived importance of the identified factors. The results revealed their perceptions regarding those eight identified factors and also their misconceptions relating to these factors, such as communication being the seventh most important factor. By developing these eight factors that require either human capital development or organizational development, the extension organization and its officers will begin in rectifying the identified problem. This study will ultimately lead to the subsequent development of an extension model for the Eastern Cape. Within the agricultural environment, the critical stakeholders are the farmers together with agribusinesses, extension officers, researchers, trainers and educators. Generally, problems flow from farmers and agribusinesses to the extension officers and researchers, who thereafter help in solving the problem and relay solutions back to the aforementioned stakeholders. In South Africa, there are dual economies in the agricultural sector (DoA, 2001). This is comprised of mainly white-owned commercial farmers and black-smallholder farmers. The country has land-reform policies that are committed to transferring at least 30% of white-owned commercial farms to emerging-black commercial farmers by 2014 (Xingwana, 2008). However, this cannot occur if these transferred farms lose productivity and place the country at risk of food insecurity. The challenge is for the extension and advisory service, and mentors to contribute towards ensuring that these transferred farms remain productive and even increase in productivity. The agricultural extension and advisory service in South Africa is generally challenged to help farmers to help themselves and to facilitate optimal and sustainable resource utilisation, which would have a direct contribution in solving the problems of rural poverty, food insecurity, and income and employment losses. The Eastern Cape Province of South Africa is comprised of large-scale farmers and smallholder farmers. Extension activities, from the public sector, are aimed mostly at the latter group, but these efforts have been largely ineffective in solving the aforementioned problem (DoA, 2001). In the Eastern Cape, this argument equally applies to high-potential underdeveloped "former homeland" areas. According to Bese (2007), there is not one single extension model that is suited to every situation in South Africa. Approaches need to be adapted to local situations. It is further suggested by Bese (2007) that a forum be established to help support the extension service. This led the authors of this paper to believe that there is a need for an extension model specifically designed for the Eastern Cape. The purpose of this model is to help extension officers to mobilize farmers in becoming sustainable and commercially viable. By commercially viable it is meant that farmers can generate an income from agricultural activities that can be used for consumption and investment, and by sustainable it is meant that practices are socially acceptable, economically viable and environmentally friendly (Dumanski, 1997). In order to formulate a model for agricultural extension, one first needs to determine what factors are critical for effective extension. A number of questions were compiled in a questionnaire and common questions were grouped together to form the critical factors. Quantitative data was received from the questionnaires that were completed by extension officers and selected researchers (80 post-graduate students). The data received from the research population was used to determine what factors they perceive to be of greater and lesser importance. By establishing these factors and their perceived relative importance, the Eastern Cape's Department of Agriculture can use this information to build upon the extension service's and extension officers' capabilities - within these critical factors - for effective extension. According to Rivera & Qamara (2003), extension services need, among others, both organizational and human capital development (HCD). Organizational development is defined as a planned process of solving an organization's problems and improving its effectiveness. It includes changing organizational structures and processes and is aimed at, among others, enhancing human capital (Cummings & Glassman, 1991). HCD has been defined as the expansion of human capabilities and functions in order to improve their effectiveness (Budlender, 2003). According to Jordaan (2008), HCD also includes improvements in personal knowledge, attitudes and behaviour, but it is often ignored in favour of improving institutions and infrastructure. To determine the factors critical to effective extension and their perceived importance, a sample population of 180 participants was selected. Of these participants, 80 were researchers and 100 were extension officers while divisions according to gender of the participants included 73% males and 27% females. These divisions between status and gender were considered so that a comparative study could be performed. The participants were requested to complete a structured questionnaire consisting of individual items or questions and common questions were grouped together to reflect eight factors that affect extension. Researchers form part of the extension team as they supply extension officers with information who in turn supply the information to farmers, a process known as technology transfer (Bembridge, 1991). Of the critical stakeholders mentioned above in section one, only extension officers and researchers were used in the research. This is due to the fact that the problem has already been established and is now under research by these stakeholders. Literature that concerns these eight factors was reviewed and the data was analysed by a combination of descriptive and inferential statistics. Descriptive statistics were used to describe and compare the responses for each item and groups of items of the overall sample, as well as by the variables status (researcher or extension officer) and gender (male or female). The descriptive statistics that were included are the mean and standard deviation. The mean is the average score for the group on each of the factors and the standard deviation represents the degree of variability between scores, in other words the average deviation of the individual scores from the mean. The mean scores of the factors that are determined by the descriptive statistics are ranked and listed according to perceived importance. The level of importance that respondents attributed to these factors is compared to reviewed literature to compare the accuracy of these perceptions. Inferential statistics are used to test the differences in responses to the eight factors for the variables of status (researcher or extension officer) and gender (male or female). This was performed by means of a t-test for the different groups. According to Pallant (2005), this is the most appropriate test to use when comparing the mean scores for two independent groups. The personal characteristics of the extension officer includes their availability to the farmer, listening skills, preparedness to dirty their hands, timeliness, honesty, ability to get on with people, enthusiasm, common sense and initiative, ability to work unsupervised and have a good work ethic. Jibowo (2008) identified various challenges for effective extension. These challenges have a bearing on the personal characteristics of extension officers and how they perform their duties. Terblanché (2005) agreed with this sentiment by stating that effective extension requires extension officers becoming a part of the community and gaining credibility. This is achieved through personal characteristics that are conducive to effective extension and by being a technical expert in a specific field of study. This factor needs HCD. Training of extension officers involves the training in principles of effective extension, a formal qualification, HCD, technical expertise in at least one field that is relevant to the area of responsibility/extension ward, a strong knowledge-support system, recruitment of qualified people, linkages with tertiary institutions, adequate flow of research and in-service training. In addition to these, it is of extreme importance for the extension officers to also have a sound knowledge of the client base, environment, potential, resources, priorities, etc. Jibowo, Dube & Akeredolu (2008) defined training as the acquisition of specific skills, knowledge or attitudes that can be used in specific situations. This can be achieved by having inexperienced extension officers working under experienced extension officers and by having the required attitude. Jordaan (2008) stated that research conducted in East Asian countries revealed that countries that placed strong emphasis and investments on HCD experienced faster economic development, although it is a long-term investment that requires continuous support. Training is not only about HCD, but also about organizational development as a knowledge-support system is required with relevant training material that extension officers can be trained in. This requires partnerships with various institutions such as universities, government, non-governmental organizations, extension officers and communities concerned. Different partners have different skills that can contribute to extension work and in this way there is a flow of knowledge from various institutions to the extension officer, which will ultimately help the farmers (Jibowo, et al, 2008). This factor requires HCD for training in principles of effective extension, formal qualifications and technical expertise in one field of study. Organizational development is required for a strong knowledge-support system, recruitment of qualified people, linkages with tertiary institutions, adequate flow of research and in-service training. Leadership and mentoring ability entails a clear vision that is future focused, recognition that the farmer's situation is unique, realize people's potential to improve, help farmer conceptualize and prioritize, guide farmers to sustainability, give recognition to farmers' plans, understand behavioural change, encourage self-help and recognise experience-based knowledge systems. According to Lansdale (2008), leadership and mentoring ability can be defined as a nurturing process whereby the knowledgeable extension officer befriends, encourages and teaches farmers. This is performed for the purpose of promoting the development of farmer and farm. Terblanche (2007) found that mentors can be confronted with various obstacles. These obstacles come from both sides and include, from the extension workers' side, frustration occurring from the extension officer's mentoring style which does not meet the farmers' needs and the extension officer may expect too much of the farmers within an unrealistic time period. Obstacles from the farmers' side include farmers having hidden agendas, they might demand more time than necessary and they may have an inappropriate attitude to be mentored. This factor will require HCD. Institutional support (technical and skills) concerns the need for technical support, logistical support and relevant technologies. Support is given in the form of training of extension officers. This should be supplied firstly by the extension organization as well as by universities, colleges, the Agricultural Research Council, cooperatives and by national and regional government agricultural departments. There are varieties of proposed agricultural development programs in South Africa, but there is insufficient support to facilitate such programs. Support and relevant research is needed and should flow to extension workers so that they in turn can help farmers (Lategan & Raats, 2006). Van Rooyen & Bembridge (1998) argue that commercial, emerging and subsistence farmers have different needs and research is needed for the different types of farmers so that extension officers can be better equipped. This factor requires organizational development so that human capital can be developed. Financial support entails understanding farming as a business, provision of incentives/remuneration and the availability of working capital. According to Ortmann & Lyne (1995), who performed an economic evaluation on a farmer support program, found that the costs of implementing such programmes - or for that matter, any such programme - is high. Bembridge (1991) agrees that financial support and a strong commitment from the government are important for effective extension. The present extension organization inherited the organization from the previous government whose agricultural system was based on protected markets, but this is being changed to an open market. Research is presently needed that will allow farmers to compete competitively on the open market. Coupled with this problem is the fact that the present extension organization has a limited operational budget, which has further incapacitated the organization (Lategan & Raats, 2006). This is further evidence that a revised extension model is needed. Understanding farming as a business requires HCD, while the remaining aspects of this factor require organizational development. Community cooperation and networks involves the identification and recognition of local structures, and earning the respect of the community. According to Terblanché & Duvel (2000), it should be remembered that established groups exist within communities and these groups have leaders that have a significant influence over other members. Groups also have reasons for their establishment and these need to be understood. Bembridge (1991) further adds that one should make a list of formal leaders, local farmer organizations, influential persons, opinion leaders and potential leaders. In a study of opinion leadership in Lesotho, Williams & Duvel (2005) found that opinion leaders were not always the best farmers, but had status within the community. They recommended that extension officers should exploit opinion leaders by providing them with competencies and knowledge so that they can disseminate information. These facts give evidence that identification and recognition of local structures is a factor that facilitates success. It has been found that successful cooperatives have strong links with the extension organization, which has led to better functioning cooperatives and ultimately better farmers (Dagada, Nesamvuni, Stroebel & Van Schalkwyk, 2007). This factor requires HCD. Communication concerns good communication skills and the ability to speak the language of the people in the area. Well-developed communication skills form an integral part of the professional behaviour that extension officers are expected to exhibit and it is one of many competencies that extension officers need to develop in order to be effective (Stevens, 2007). According to Dagada, et al. (2007), all aspects of agriculture require communication with people. It is estimated that 75% of 150 000 extension officers in sub-Saharan Africa do not have university degrees and although they have undergone training in technical agriculture, they have not been trained in the human aspects of extension, such as communication (Jordaan & Jooste, 2003). It has been recommended that communication channels between extension officers and farmers be enhanced so that farmers can get better access to skills and knowledge (Tsheole & Lepule, 2008). It should be noted that communication is a two-way process and both farmers and extension workers need to be trained and equipped for effective communication and this forms part of the HCD that is needed. Staffing involves ensuring an adequate number of staff and restricting personnel from being overloaded by work. The extension organization is comprised of training, research and extension, and the staff of the organization need to do these tasks. In the Eastern Cape Province, and also in South Africa, the extension organization is unable and inefficient in their response to fulfilling the needs of rural communities (Lategan & Raats, 2006). Farmers interviewed in Qwa Qwa, Free State Province, responded that good extension support is needed for long-term sustainability (Jordaan & Jooste, 2003). This means that for effective extension, there needs to be a sufficient number of extension officers available to support all the farmers in the country. This would however require extensive financial support. Improving this factor will require organizational development. Table 1, below, ranks these factors according to what is perceived most important to what is perceived least important by the overall group. It should be noted however, that none of the scores for any of the eight factors are low (when considered out of a maximum of 100). The lowest rated factor, staffing, still had a mean score of higher than 80. It can also be seen that the two factors with the lowest scores also had the largest amount of variation between responses, as indicated in the relatively high standard deviations. From this, it can be concluded that within these two factors, the responses of the participants differed more than the responses of the participants with regard to the other factors. The lower standard deviations for the factors personal characteristics, training and leadership indicate that within these factors, participant responses were more uniform. Perceptions are not always accurate, as testified by the fact that in the Extension Recovery Plan, the need for more staff is recognised (F.D. Bese, 2010, Senior Manager: Extension & Advisory Service, Pers. Comm. ), while the overall group ranked this factor eighth. Communication was ranked as seventh most important, but well-developed communication skills are recognised as an integral part of effective extension (Stevens, 2007) and communication is required at all levels of agricultural activities (Dagada, et al, 2007). Although, within the five highest-ranking individual items, the overall group ranked good communication as the most important item and this had a low standard deviation too. This is displayed below in Table 2. 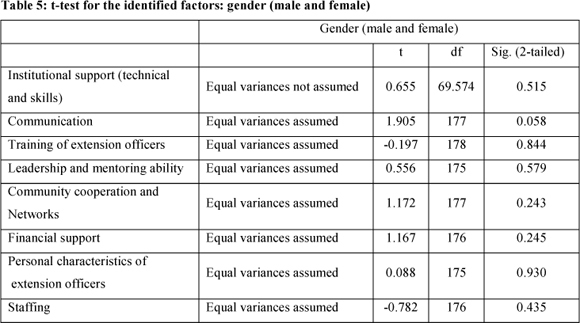 Table 3, below, displays the descriptive statistics for the identified factors according to status and gender. As can be seen from Table 1 and 3, the three top-rated factors -with relatively low standard deviations - across all groups are the personal characteristics of the extension officer, community cooperation and networks, and training of extension officers. There were, however, various differences in how the different groups rated other factors. 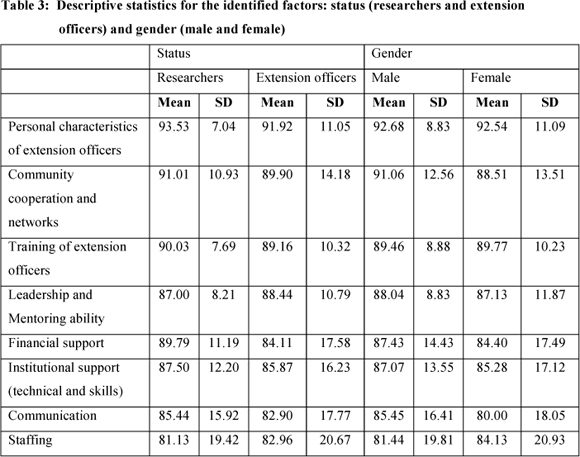 Inferential statistics, with the use of a t-test, were used to test the differences in responses to the eight factors for the variables of status (researcher or extension officer) and gender (male or female). 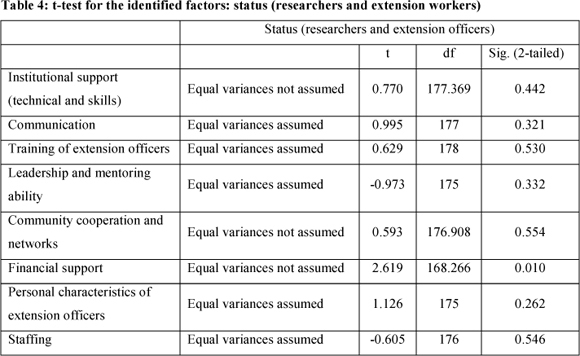 It was found that there are significant differences between extension officers (Mean=89.79, Standard deviation=11.9) and researchers (Mean=84.11, Standard deviation=17.58) in terms of financial factors (t=2.619, p<0.05, two-tailed). In this case, the researchers indicated that finances played a more important role than the extension officers did. There were no significant differences between these two groups on any of the remaining factors. This could be the result of the locality and living expenses of the different groups, with researchers living in urban environments while extension officers generally live in rural areas. Presented in Table 4 below, is the t-test for the identified factors according to status. Concerning the results from the t-test between genders, it was found that there were no significant differences between males and females in terms of how important they ranked any of the factors to be. The results for the t-test to test the differences between mean scores for gender is presented below in Table 5. As can be seen from the data, there is a consensus about what factors are perceived to be more important for effective extension. There certainly are more factors that contribute to effective extension. It is recommended that a future study, with the same eight factors or additional factors, be conducted that includes clients (farmers), NGO's and private service providers. It should be noted that all of the identified factors are important and should be incorporated into the extension organization in a holistic manner. It should be further noted that a division is made between these eight internal factors into those that need HCD and factors that require organizational development. Measuring the effectiveness of extension once these factors have been addressed is required. Indicators for these factors should be developed, but this was not addressed and will require further research. Factors that require HCD include the personal characteristics of the extension officers, leadership and mentoring ability, community cooperation and networks, communication and training of extension officers partially requires HCD. The training of extension officers, institutional support (technical and skills), financial support and staffing fall in the category of organizational development, although all factors need organizational development as HCD is under the organization's control. The extension organization needs to take cognisance of these eight factors and should develop the organization within staffing, financial support, institutional support (technical and skills), training of extension officers and other HCD. It also needs to ensure that the organization develops its human capital, especially in areas that respondents paid less attention, such as communication. As identified earlier, an agricultural extension model is needed for the Eastern Cape. The factors that were identified form the basis from which the proposed model will be based. The proposed model will need to identify various stakeholders that are involved in the broader agricultural environment that will be able to help in the development of the extension organization and in the development of the organization's human capital. This, however, will have to be dealt with in a subsequent study.